The post came five days after Tlaib urged Democrats to “impeach the motherf—,” referring to President Donald Trump. “Proudly signed. A Hamas-loving anti-Semite has NO place in government! She is a danger and [I] would not put it past her to become a martyr and blow up Capitol Hill,” Lima-Taub wrote, according to the South Florida Sun-Sentinel. Lima-Taub reportedly removed her post shortly after the Sun-Sentinel reached out to her for comment, and has since faced harsh criticism from fellow Hallandale Beach commissioners and demands for an apology from Muslim advocacy groups. 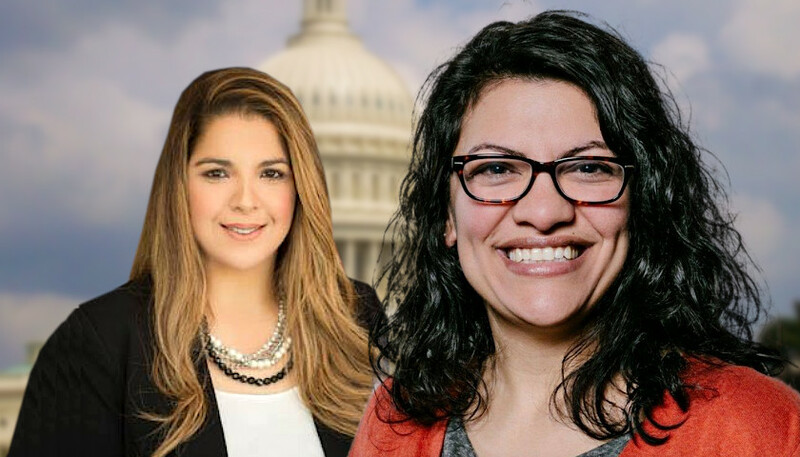 “This sort of hateful anti-Muslim rhetoric doesn’t happen in a vacuum – this President embraced it and Republicans have happily gone along with it,” Tlaib said. Tlaib also wore a traditional Palestinian Thobe to her swearing-in ceremony, during which she made a point to take her oaths on a copy of the Quran. Tlaib was photographed with pro-Hezbollah activist Abbas Hamden, the executive director and co-founder of Al-Awda who attended her swearing-in ceremony and a subsequent dinner with her and her family. Photo “Anabelle Lima-Taub” by Anabelle Lima-Taub. Background Photo “Capital Hill” by Lars Di Scenza. CC BY-SA 4.0.